The rear fascia of the 2014 Camaro has small dimples at various locations around the license plate area. These dimples provide an accurate reference for the mounting locations for various sized license plates, depending on the market where the car is sold. During Pre-Delivery Inspection (PDI), it may appear that the license plate mounting holes should line up with the large rectangular holes in the rear fascia. This is not the case. 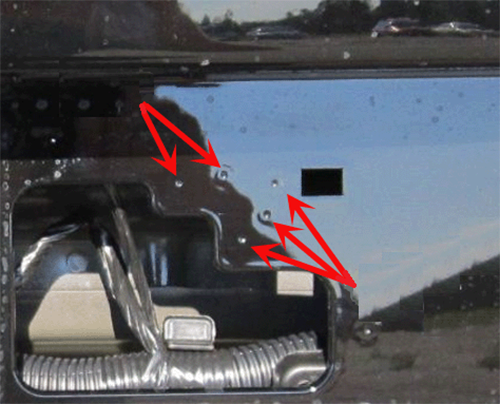 Behind each of the rear fascia dimples (See image below) is a plastic boss. 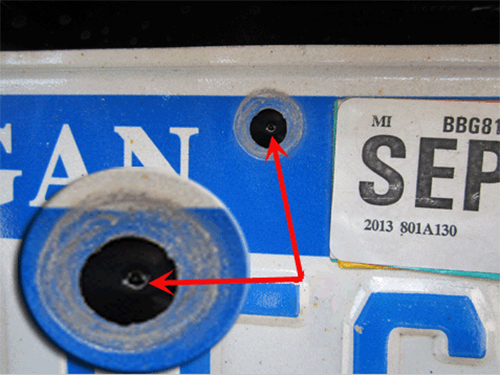 With the correct location confirmed, install the license plate using the self-tapping screws included in the PDI bag. It is not necessary to pre-drill the holes. The self-tapping screws will attach the license plate to the rear fascia.